I know what you guys are thinking. Why are we already talking about Valentine’s Day when it feels like New Year’s ended last weekend?! Well, February is fast approaching, and I am so ready for all treats red, white, and pink, of course! ;) Plus, I am SO excited to introduce you all to our new BFFF cake contributor, Ashley Twilley! 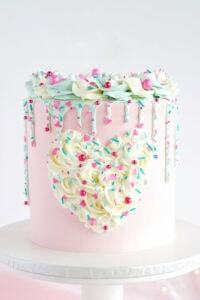 She has a serious knack for creating desserts that look oh so pretty and are incredibly delicious! 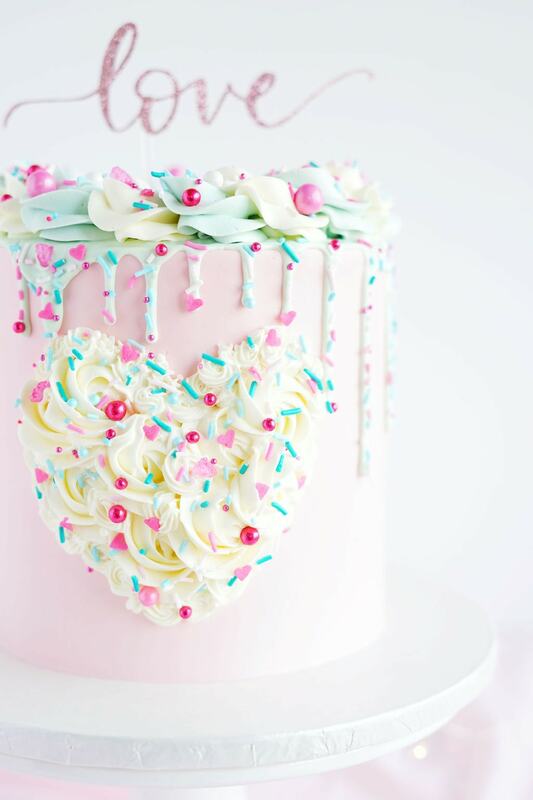 I cannot get enough of this adorable cake (hello sprinkle obsession)! ;) We met off Instagram and I fell in-love with her cakes. She’s a CPA by day and makes cakes as a hobby. Who else thinks she needs to open her own shop?! 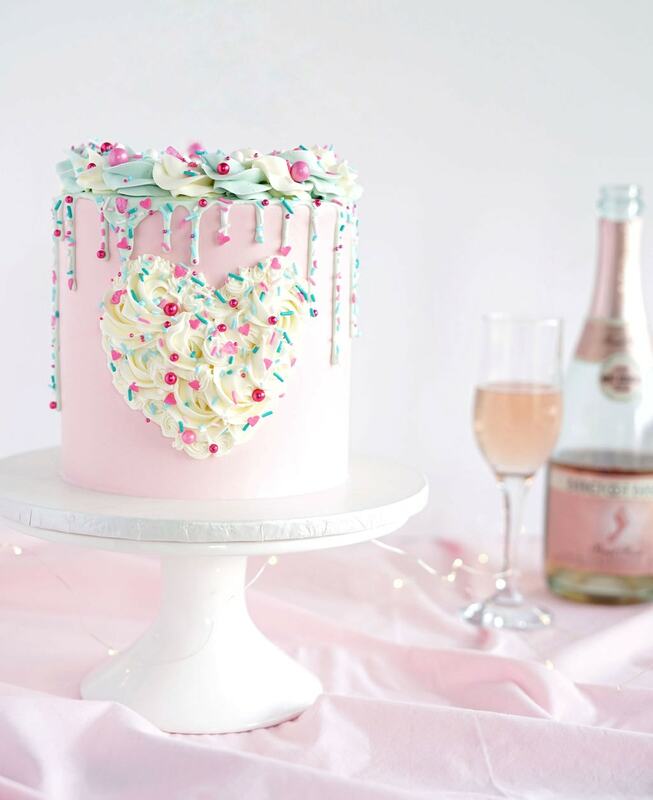 I can’t get over how beautiful this Champagne Cake is! Not only is this cake filled with the flavor of the pink champagne, but there’s also hidden strawberries between each cake layer! 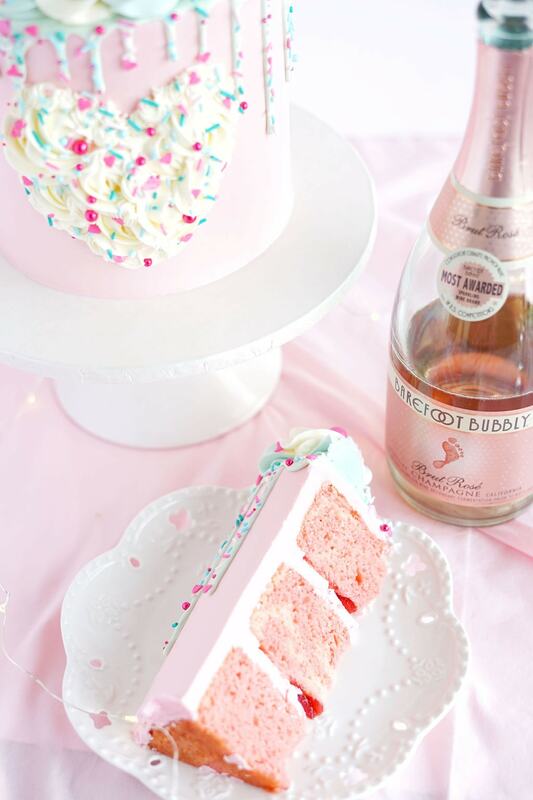 What more could you want in a cake than champagne and strawberries?! 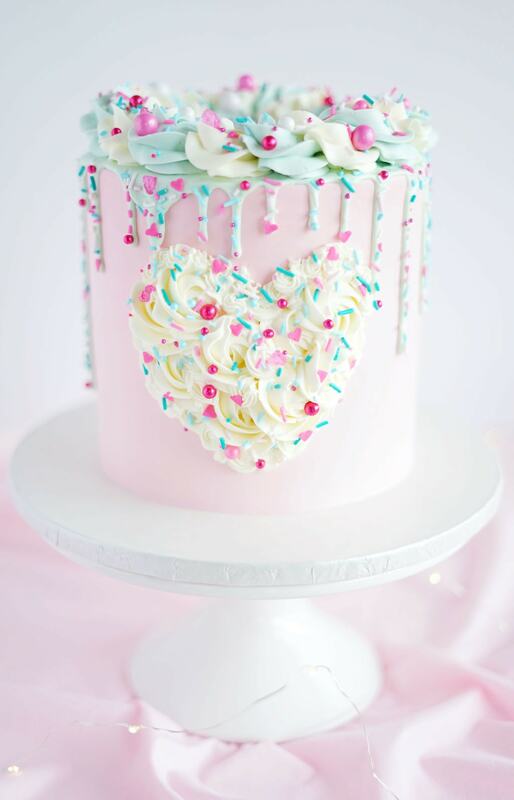 Plus, this cake is topped with the fluffiest meringue buttercream (that I am slightly obsessed with)! 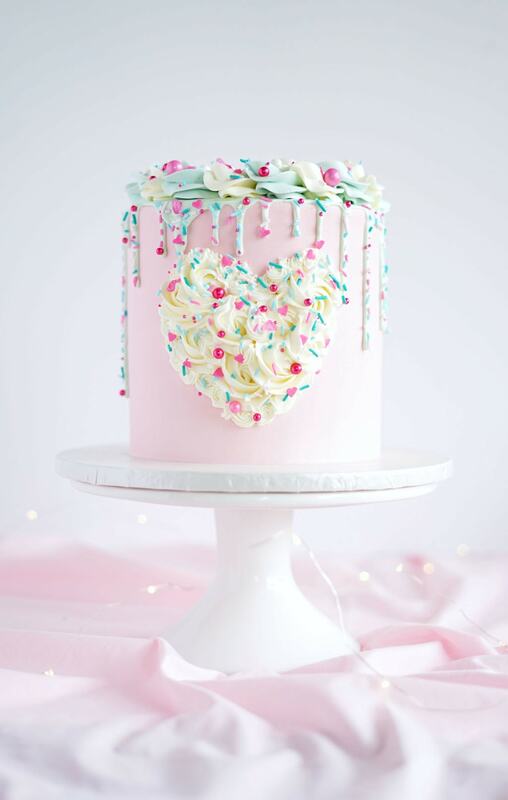 ;) I am totally loving this cake for Valentine’s Day, but I’m also dreaming up so many ways of when to recreate this masterpiece (possibly just so I can have more of this amazing frosting)! This Swiss Meringue Frosting is seriously so delicious and also doesn’t take a kitchen full of ingredients to make. All you need is sugar, egg whites, salt, butter, and some vanilla extract. Just whisk your sugar, egg whites, and salt together until combined, while you heat a small amount of water in a saucepan until boiling. Create a double boiler with your mixing bowl and saucepan, whisking continuously while the egg mixture heats up. Begin mixing in stand mixer, starting on low and gradually moving to high, until the meringue is glossy with stiff peaks. Lastly, mix in your butter until smooth, then add in vanilla, switching out the whisk for the paddle attachment to beat the frosting on medium speed until smooth. 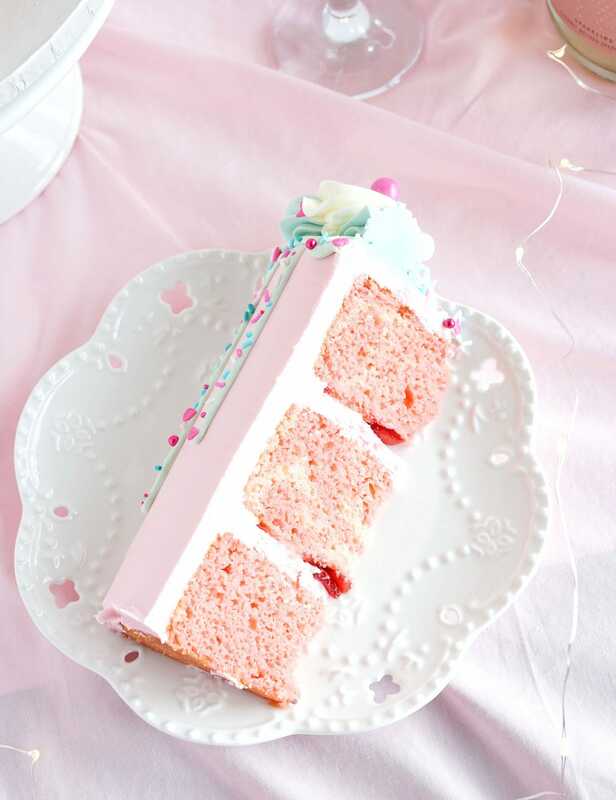 This pink champagne cake is melt-in-your-mouth delicious and absolutely perfect for that Valentine’s Day party, or your next girls’ night in! All you need to do is preheat your oven to 325° F and line the bottoms of three 6in cake pans with parchment paper. In your stand mixer, with a whisk attachment, mix the dry cake mix, flour, sugar, and salt until combined. Switch to the paddle attachment and add champagne, sour cream, vegetable oil, vanilla, and eggs mixing on low-medium speed until combined (make sure to not over mix). This is where you add in my favorite park — pink food coloring — to create that perfect Valentine’s look. Lastly, pour 1/3 of the batter into each cake pan and bake for about 25 minutes, or until the middle has set. 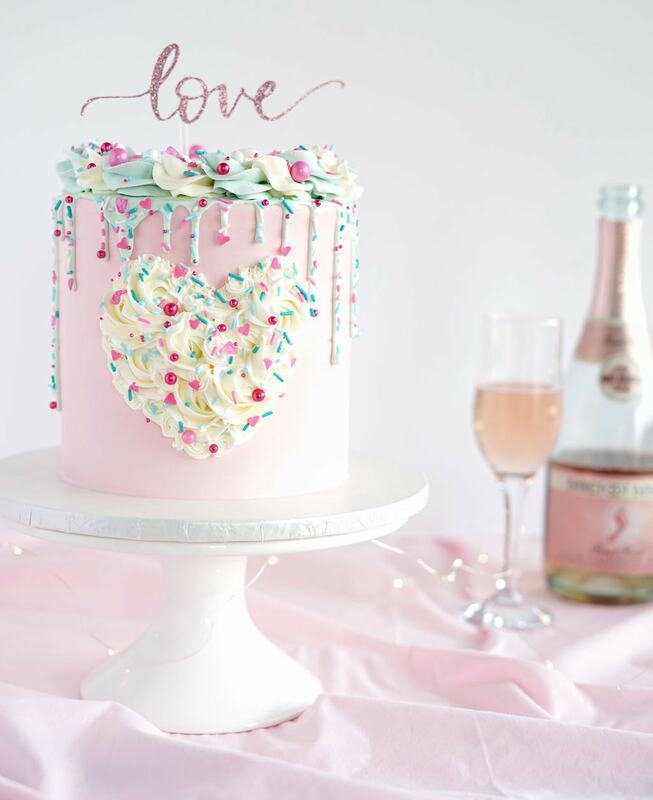 This champagne cake seriously takes the cake as the best Valentine’s dessert! ;) I mean it’s pink and covered in sprinkles which just screams perfect in my head! But, you also won’t be able to get over the subtle sweetness of the champagne and strawberries mixed with the delicious vanilla meringue buttercream. I would love to hear if you all use this recipe for any of your upcoming parties! Let me know in the comments what desserts you guys will be serving this Valentine’s Day! Here’s to all the pink desserts to come! Drip recipe and instructions please!! !